I’m not a vegetarian, I never will be. I do feel comfort in the knowledge that the animals I do consume have had the best life possible. I still can’t look a piglet straight in the face though………. 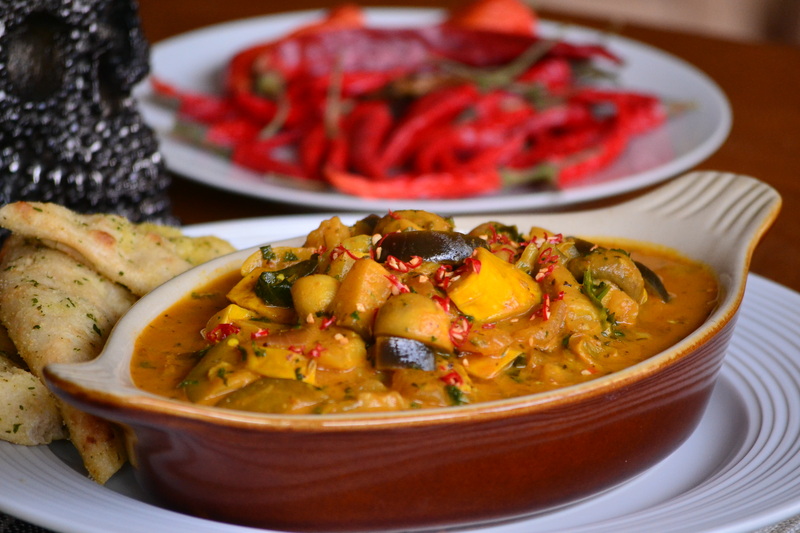 This is one of the vegetarian dishes I would bite your arm of for…..ironic that……! This is a super fast, super easy vegetarian’s dream, hot spicy and creamy, in truth you really would not notice the absence of any meat in this dish – the big robust vegetables stand well on their own. This is a one pot wonder, I make it in a flat bottomed wok as it’s really handy. Start by frying off the courgette, aubergine, garlic, onion, mushrooms and cabbage in some veg oil – everything in! Saute the veggies down for about 4 minutes and add some water if things start to get a little dry, add the tomato paste, cumin, coriander, lemon grass, gara masala, turmeric and chili powder all in one go and mix well until everything is coated with spices and tomato paste. Cook out the mix now for about 2-3 minutes continually moving everything around the wok on a low heat. Next add the stock, curry leaves and the coconut milk and simmer everything for about 6-8minutes. Serve the curry with garlic flat breads or jasmine rice. For the meat eaters reading this, don’t worry this Brilliant Beef Curry is for you! Next Post Just funky Donuts really!